The album opens with the joyous interplay, anthemic statements and shifting rhythms of “Dream State”, a quick-moving surrealist fantasia. A crisp drum roll follows, introducing the twisty theme and modal steps of “Full Sun”, a showcase for double bass that switches from counterpoint lines to solid walk as the piece unfolds. 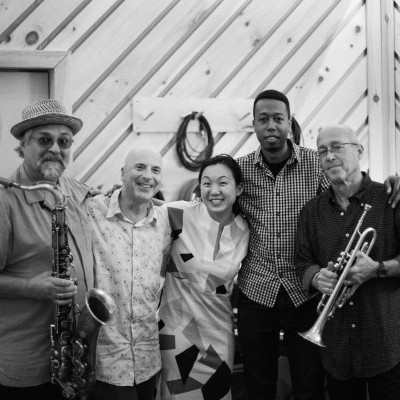 Later in the set, the moody title track intertwines muted trumpet and breathy tenor sax over an evolving downbeat pulse, and “The Corner Tavern” unfolds jauntily over a mix of oblique Cuban pulse and swing. “Mission Creep”, in contrast, builds from medium lope to up-tempo piano romp and then subsides. Two Shorter covers are re-shaped to fit the “Sound Prints” aesthetic. The originally dreamy “Fee Fi Fo Fum” builds sax and trumpet to a peak, while a now quizzical “Juju” launches an enthralling group discourse. The album closes with “Libra”, an elegiac Douglas ballad built on rippling piano and a swish of drums.